I haven’t done a good job of reporting on our trip a week ago to Harpers Ferry, Antietam, and Gettysburg. There’s my post from a week ago last night, to which I just added two photos. It’s more an outline than anything else. I’ll say a little more now, but the problem is, you kind of have to be there. I already mentioned that two Saturdays ago, after passing through Harpers Ferry National Historical Park in West Virginia, we drove on to Sharpsburg, Maryland, to Antietam National Battlefield, where we took a three-hour guided tour. One of the oddities of our time at the bridge was that a group of young people were using it and its environs for a photo session. They were dressed formally, as if for a wedding. 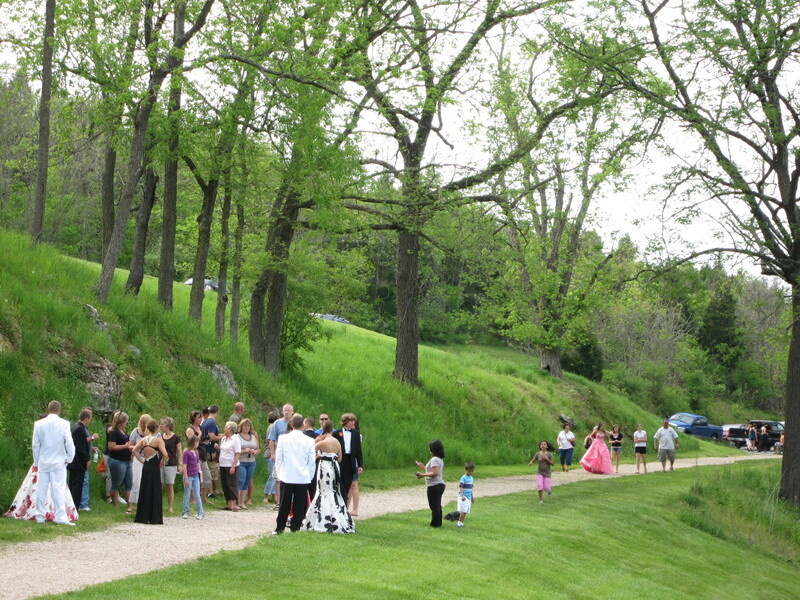 We speculated that maybe it was a prom, but they were perhaps a bit too old for a prom. Not by much though. Or two weddings, as there seemed to be a couple of bride candidates, and one had been with a possible groom in dress military uniform. They had disappeared from sight by the time we worked our way down to the bridge from the lookout above. A beautiful setting, but not one that lends itself naturally to celebration. We seem to have a shortage of Antietam photos, so I’ll move on to Gettysburg. There is a photo of the bridge over the creek in my earlier post. 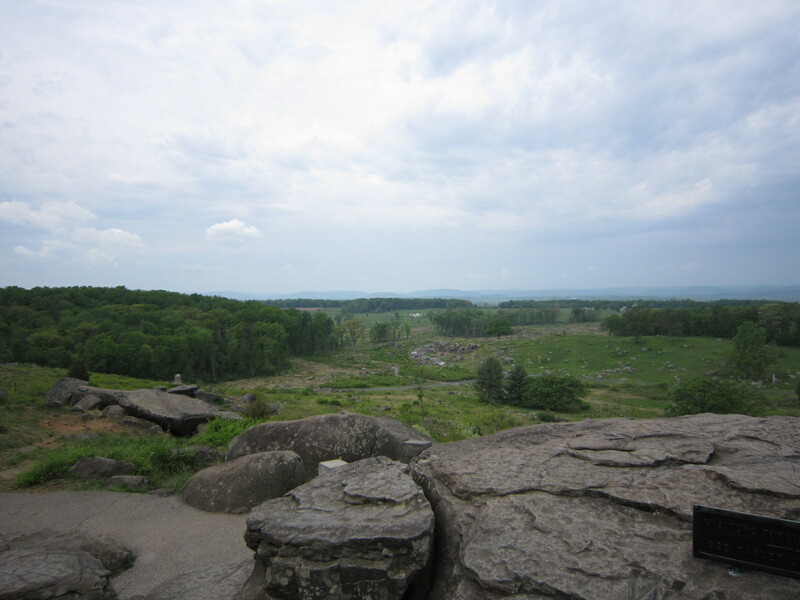 I also mentioned in that post our drive up to Gettysburg after the Antietam tour, and the fact that we took an official three-hour tour of the Gettysburg battlefield the next day. The Gettysburg tour had a different character. For one thing, our guide had been driving people around for years. Plus, the Gettysburg guides, as best I can tell, are full timers, whereas the Antietam guides are more hobbyists or amateurs. 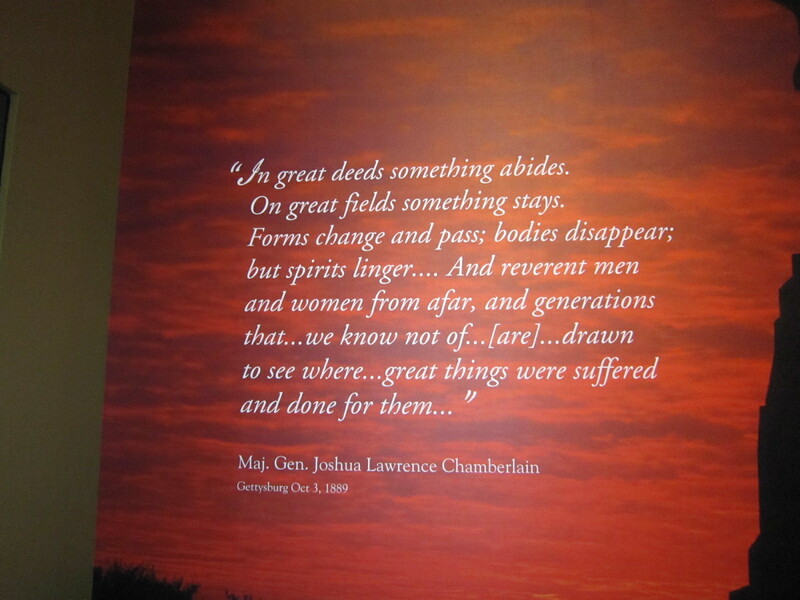 We felt more plugged into a system at Gettysburg, with the sites carefully charted and the remarks well rehearsed. Our guide insisted on driving our car, perhaps wise, so she could focus on talking to us rather than also having to be giving directions constantly. There are many places to go, many stopping points, many criss-crossing roads. It’s a complicated place, with three days of battle to describe and look at. 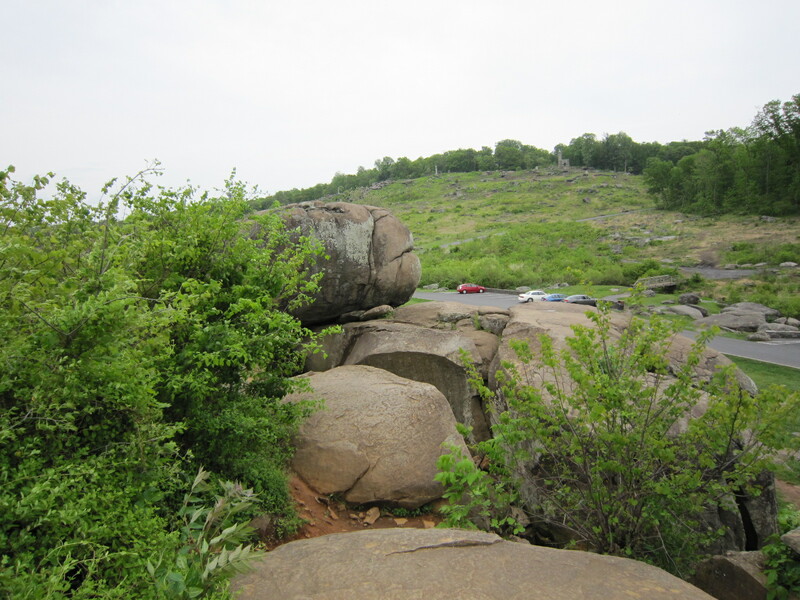 I had read James McPherson’s Hallowed Ground: A Walk at Gettysburg in preparation (as discussed in a post I wrote before the trip). Gail had just started it. But even armed with the background, it was all a haze as we zipped around for miles and miles, listening to our guide and seeing everything anew. We added a third layer that afternoon, after lunch at the Visitor Center (newly opened in September 2009). First we watched the center’s 20-minute video, A New Birth of Freedom. The audience is then directed to the escalators, taking us up to the famed cyclorama The Battle of Gettysburg, painted by Paul Philippoteaux in 1883 and depicting Pickett’s Charge on the third and final day of the battle. Cycloramas, as you may know, are circular paintings. Picture painting the inside of a large cylinder, with the audience able to view the resulting painting from within, walking around to inspect all the scenes. The Gettysburg cyclorama is about 30 feet high and 360 feet in circumference. As part of the tour, the movie audience is brought into the cyclorama, then given an audio presentation as different parts light up to show explosions or guns firing. After the presentation, we are allowed to stick around for closer viewing for a few minutes, then ushered down the stairs. Not one of the high points in our education, but well worth seeing. Anyway, it’s a fabulous museum, and by the time we stumbled out at 5:30, some 7 1/2 hours after starting our tour, we were exhausted. We took a break to rest at our inn, then went back into town for dinner, then retreated to the inn again. That’s when I wrote part I of this trip report, as well as trying (and as it turns out failing) to get timed entry tickets for two mornings later at Ford’s Theater in DC. The next day, Monday, a week ago today, may have been the highlight of our trip. After checking out of the inn, we drove into the center of Gettysburg, parking right in front of the David Wills House, where Lincoln stayed the night before delivering his address. We walked around town a bit, discovering that almost all the stores close on Mondays. We entered the lone open one, talking at some length with the proprietor about the nature of running a business in Gettysburg, about provisioning the hordes of re-enactors, about the climate, and so on. And then we spent the next hour and a half re-tracing much of our drive around the battlefield the day before. We could see cars zooming by on Emmitsburg Road, which the Confederate troops had to cross in their ill-fated charge, and which we ourselves had zoomed down in the dark two nights earlier, having missed the turn back to our inn. We had stopped at Friendly’s for dessert (strawberry Fribble* for me), then turned out of the parking lot and driven out of town. We had no idea where we were. In particular, we didn’t have a clue that we were actually in the national park grounds, cutting through the battlefield itself on a path that was there 147 years ago and that played a crucial role. I couldn’t figure out why there were no landmarks, no places to turn around. After taking one last look over the site of Pickett’s Charge, we got back into our car, drove over to Emmitsburg Road, meeting it at the KFC, and two stores down was Friendly’s. My gosh, it’s right on the edge of the battlefield! In fact, at the time, it must have been in the battlefield. I had no idea two nights earlier of its central location, since we approached it from the other direction, along which Emmitsburg Road is filled with restaurants and inns. Thanks to private money, many of the buildings that sit in the middle of the battlefield have been bought and razed in recent years, with more still to come. But this stretch of Emmitsburg Road is not likely to be bought up. With Friendly’s right there, we decided we may as well stop in for lunch. And another Fribble. And then we headed through the battlefield again, out of town on Emmitsburg to US 15, and down to Washington, DC. News of our 24 hours in DC will have to wait for another post. *You have to understand. I spent 9 summers at camp in the Berkshires of western Massachusetts. There was a Friendly’s a few miles down the road in Great Barrington. Friendly’s made the greatest shake in the world, the Awful Awful. Nothing was better than getting to go into town for one. For some legal reason, Friendly’s had to abandon the name. By the time I returned to Massachusetts to go to college (Friendly’s had yet to reach Long Island), the Awful Awful had become the Fribble. It never seemed the same after the name change, but I still can’t resist. And it was a staple of the Harvard lightweight crew. On the week of a race, they would have to weigh in on Friday afternoon, like wrestlers. Then the lightweight manager, having taken their orders, would head to Friendly’s to pick up their Fribbles. I was with the heavyweight crew, so I didn’t get to partake. I comforted myself with the thought that Awful Awfuls were better, so I wasn’t missing anything. Now I don’t bother comforting myself. I just order the Fribble. And that’s what I did last week.